Paull Krugman is now a joke(see this town hall meeting), but he's clearly a smart guy. I think he just decided that he could do more good shilling for Democrats by any means necessary, and if his intermediate target is helping Democrats, being more evenhanded, or even courteous, may or may not be optimal, it is too early to evaluate. In the long run, I think it hurts his intermediate objective, and more importantly think his long run objective is wrong so he's doomed anyway (in the same way I think those who believe in false Gods are wrong, they won't go where they think they are going). Economics and evolutionary theory are surprisingly similar. It is often asserted that economic theory draws its inspiration from physics, and that it should become more like biology. If that's what you think, you should do two things. First, read a text on evoluationary theory, like John Maynard Smith's Evolutionary Genetics. You will be startled at how much it looks like a textbook on microeconomics. Second, try to explain a simple economic concept, like supply and demand, to a physicist. You will discover that our whole style of thinking, of building up aggregative stories from individual decisions, is not at all the way they think. So there is a close affinity in method and indeed of intellectual style between economics and evolution. But there is another interesting parallel: both economics and evolution are model-oriented, algebra-heavy subjects that are the subject of intense interest from people who cannot stand algebra. And as a result in each case it is very important to distinguish between the field as it is perceived by outsiders (and portrayed in popular books) and what it is really like. We all know that economics is a field in which the most famous authors are often people who are regarded, with good reason, as not even worth arguing with by almost everyone in the profession. Do you remember that global best-seller The Coming Great Depression of 1990 by Ravi Batra? And I guess it is no secret that even John Kenneth Galbraith, still the public's idea of a great economist, looks to most serious economists like an intellectual dilettante who lacks the patience for hard thinking. Well, the same is true in evolution. He makes a profound point, that evolutionists dismiss the small-step process of evolution and rather focus on the result. Local maxima are dismissed as simply a lack of imagination. Atlas Shrugged seems to be getting the same reception that the 500th anniversary of Columbus discovering America got back in 1992. Timing is important, and currently egalitarianism dominates individualism in the world of ideas. Over at Bloggingheads, Noah Millman articulates the belief that meritocracy is horrible because it is antidemocratic. Millman seems to think that just because merit can't be measured infallibly it should be ignored. Further, he seems to think society is currently 'run' by an elite chosen by some Star Chamber according to some merit metric; I tend to think many leaders are simply popular people who learn how to navigate reverse dominance hierarchies, and these leaders are pretty widely distributed--politicians at many levels, businessmen who compete against each other. Aristotle noted in his Politics Book 3 that justice is in one sense simple, equality. What makes justice hard politically is, equality of what? I much prefer an imperfect meritocracy to a society where merit is considered meaningless. This picture shows the housing component of inflation (blue line), compared to house price changes (red line). 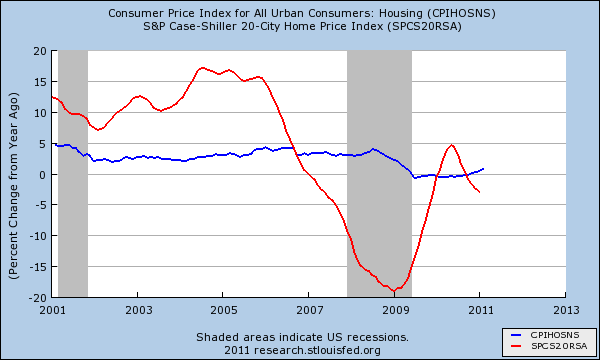 As housing prices went through their bubble, the effect on CPI didn't budge much from 3%, whereas the recent crash brought it down to zero. See Dr.HousingBubble for more. Unless entitlements are substantially reformed, I am confident that this country will default on its debt; not in conventional ways, but by picking the pocket of savers via a combination of less observable, yet historically verifiable policies--inflation, currency devaluation and low to negative real interest rates. And while the income tax is quite progressive, the payroll tax — the other major federal tax — isn’t; and state and local taxes are strongly regressive. For generations it was sold as a pension, not a tax. The 12.4% of our compensation (up to $106k) given to the government under the rubric of Old-Age, Survivors, and Disability Insurance (OASDI) [insurance? ], is clearly not an investment in our future government pension, unless by 'our' one means 'the Borg collective', not the individual saver. Bonds that represent the debt that the U.S. government owes to Social Security are located in a file cabinet at the Bureau of Public Debt in Parkersburg, West Virginia. 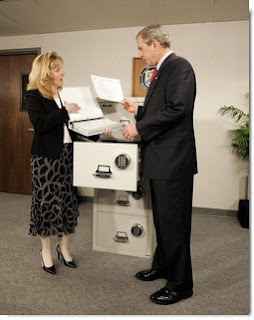 Below is a photo of President George W. Bush inspecting the documents along with Susan Chapman of the Office of Public Debt Accounting. That investors have different average returns than the assets they invest in, is the least appreciated return bias. Ilia Dichev (2005) looked at a variety of indices, and equity net inflows, and found this adjustment reduces returns by 1.3% for NYSE/AMEX for the period 1926-2002, 5.3% for Nasdaq from 1973-2002, and 1.5% for 19 major international stock exchanges from 1973-2004. These are big numbers, and almost universally an ignored by those studying the equity 'risk' premium. You can be sure that if this adjustment could be made consistent with some risk story it would be taken seriously, but what we see is influenced by what we believe and so we don't see this effect. To be precise, we don't see it as 'interesting' or anything other than random noise, because it does not fit into any big paradigm, and killing the equity risk premium would destroy the primary empirical point for asset pricing theory. In 2010, the average domestic fund earned a return of 18.7% compared with 16.7% for the average fund investor, making for a gap of 200 basis points. For the trailing three years, that gap was 128 basis points. For the past five years, it was 98 basis points, and for the past 10, it was 47 basis points. Interestingly, their studies all show a large bias that gets smaller as one goes backward over time. I'm skeptical adverse timing is primarily a recent issue because the 2001 internet bubble, as John Cochrane emphasizes, is the poster-child for adverse timing. Perhaps there's a straightforward bias to their metric, because it seems strange that it attenuates for every asset class at the same rate. Further, as Antti Ilmanen notes in his new book Expected Returns, 'momentum' in strategies is statistically significant, it is there, and suggests a 'Mathew Effect' for allocating capital. I wonder how the adverse timing, which implies average investors are buying more prior to declines than prior to increases, relates the momentum in asset strategy returns. Kyle: Dude, you don't understand, I'm a Jew, I have a few hangups about killing Jesus. Stock market participation is monotonically related to IQ...High-IQ investors are more likely to hold mutual funds and larger numbers of stocks, experience lower risk, and earn higher Sharpe ratios. We discuss implications for policy and finance research. Shane Frederick observed a related finding in a JEL piece where he noted that smarter people preferred greater expected choices when framed probabilistically. I think the IQ and stock market participation finding makes sense only in the context that the stock market exists in the context of many investments with similar 'risk'. Smarter people understand you can gain an equity premium ... but only applying indices, or as an insider! Sure you can get big return otherwise--especially as a middleman--but the basic risk return payoff here is decidedly contextual. Above is a total return graph for JPC, Nuveen's High yield convert ETF, from 2007 (ie, 1/1/2007) to present. Note the return is basically zero. I pulled 39 High Yield ETFs, and their average return from 2007 to present has been about 21%, and is the same whether I equal-weight or value weight them, and note these have a survivorship bias in them, in that I am not using all extant funds from 2007. The JPC benchmark, the Bloomberg Active Index for Corporate Preferred funds generates a similar 20% return over that period. In contrast, the Merrill High Yield Master II shows a whopping 43% return over this period, twice what bonds with that moniker actually generated. The Merrill index is not tradeable, which is very important. The bid-ask spreads in junk bonds are very high, often 5 points, and indices don't internalize these. Also, if you are big, there's trade impact. Academics might look at the Merrill index to estimate the return to junk bonds, but there's a 22% difference here, and that excludes all the survivorship biases in my comparison to actual funds. Back in 2008 when I was blogging under a pseudonym at Mahanolobis, I posted on the birth of my girl Izzie under the title Increasing my Carbon Footprint. I mentioned this was all due to a 2005 blog post, The Selfish Reason to Have More Kids, by Bryan Caplan, which he turned into a book of the same name. Of course, while it might have been a necessary condition so were many other variables, so I don't want to oversell this, but he made a compelling point (I discussed this in an earlier post). My wife admits she was quite content (overwhelmed?) with two children, I persisted, and she's now infinitely grateful. I just got the book last Friday, and its cheap, good, quick read. Maybe it will change your life! A bunch of physicists (Harmon, de Aguiar, Chinellato, Braha, Epstein, Bar-Yam) have an intriguing paper about cascades. They call it 'mimicry', but Ivo Welch really mined this field for a while, and while I think he gave it a good try, it didn't yield much. We know that in bubbles there's a lot of people doing what everyone else is doing on the way up and down. Correlations go up. It's interesting to model this as a rational outcome, as a situation in which every subsequent actor, based on the observations of others, makes the same choice independent of his private signal. 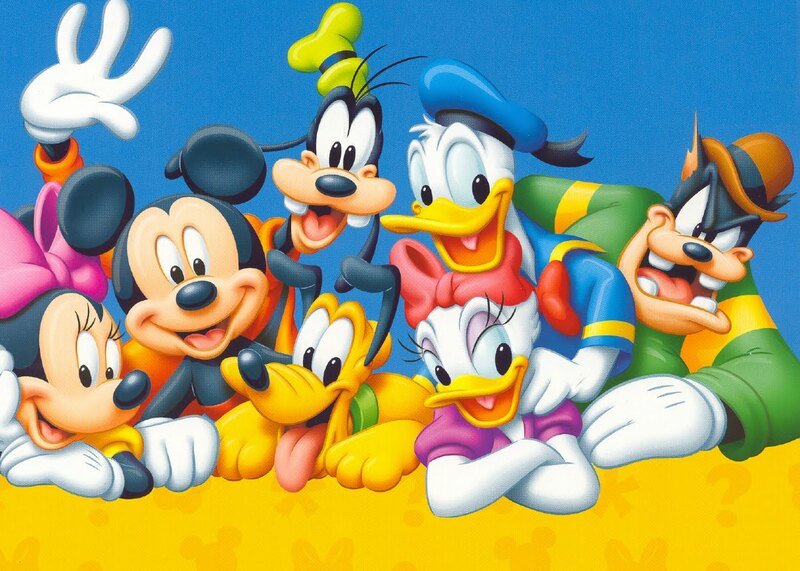 In an information cascades everyone is individually acting rationally. Even if all participants as a collective have overwhelming information in favor of the correct action, each and every participant may take the wrong action. Even though a million people may have chosen one action, seemingly little information can induce the next million people to choose the opposite action. Fragility is an integral component of the Informational cascades theory. The bottom line is that a theory should be able to not merely explain the past, that's hindsight, not science. It should predict. And these models haven't been successful here, so that thread has kind of dried up. So, here's some physicists trying again. They generate the simple time series graph above. The top graph is a measure of dispersion, so a high number means that stocks are pretty uncorrelated, the lower number means stocks are highly correlated. They find that 1) stocks have become a lot more correlated over the past 15 years and 2) the change in this metric over the past year is a significant predictor of future crises. The bottom time series shows that prior to big moves like the 1987 crash, LTCM crash, 2001 crash, and 2008 crash, this measure moved relatively downward prior to them all. It's not perfect, but I like the unpretentious way they framed the problem and presented their results. It's not overfit. John Cochrane is one of the top finance academics in the world, and I think he's very thoughtful. He's also swallowed the risk premium story so much, he's like a Keynesian who thinks the 1970's highlight the relevance of the Keynesian model. We thought returns were uncorrelated over time, so variation in price-dividend ratios was due to variation in expected cashﬂows. Now it seems all price-dividend variation corresponds to discount-rate variation. We thought that the cross-section of expected returns came from the CAPM. Now we have a zoo of new factors. In the beginning, there was chaos; practitioners thought one only needed to be clever to earn high returns. Then came the CAPM. Every clever strategy to deliver high average returns ended up delivering high market betas as well. Then anomalies erupted, and there was chaos again. The “value eﬀect” was the most prominent anomaly. Fama and French (1993), (1996) brought order once again with size and value factors. Explaining the value and size effect using value and size portfolios does work if you don't mind circular explanations. We have, as Fama stated in 1991, given a fishing license for factors, where every exception to the standard model is now a potential factor. It's a bit like the effects of Global Warming, except here you can say these are the one thousand things caused by variations in risk premiums. These are pretty vague rules, hardly sufficient for a good life in my opinion (what about courage, discipline, gratitude, or prudence?). 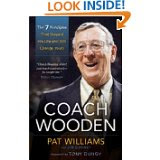 Yet Wooden was a highly successful man, living for 99 healthy years, producing many championship teams, positively impacting many young men. It reminds me of the editor of the Great Books series, Mortimer J. Adler, who's Synopticon is a very intriguing though flawed philosophy of life, yet, Adler himself was quite successful, and his influence was positive, influencing the Great Books emphasis at the University of Chicago. Suboptimal hypotheses, rightly worked from, have produced more useful results than unguided observations. I think the key is to be intelligent, start from a decent set of assumptions, and work every day towards becoming a better man. If you use reality as a filter, you will do OK.
Alas, I think more often then not such maxims from famous people are used as signals as opposed to principles. I remember one NYT story about how these junk bond investors were all acolytes of the great Ed Altman, yet I have never met a junk bond investor who thinks highly of such models, and Altman's model is pretty lame, about as powerful as rank-ordering firms by Net Income/Assets. They wanted to project gravitas, so they paid lip service to the old man. Similarly, people highlight their idea is derivative from some esteemed source, but that's merely posturing. This year I had to write a check because I rolled my 401(k) into a Roth IRA, generating a lot of taxable income that had no withholding. To give an example, say I put $5k into my IRA each year for the past 20 years. Say it grew to $200k. By rolling it into a Roth IRA, I am taking that $200k in taxable income for 2010, and so have to pay state and federal taxes on that, but then it will increase, hopefully, tax free. I'm basically betting on rising taxes for investments, as this makes sense if you think tax rates will be higher in the future than currently. Of course, I'm also betting the government won't reneg on the Roth IRA terms and tax me again. Interestingly, I'm finding that my state tax payment is about 1/3 my federal. Then I have property taxes of about 2% of my assessed house value for my city, which basically rigs the rate vs. assessment so that my payment is constant. The researchers found a person's tendency to describe others in positive terms is an important indicator of the positivity of the person's own personality traits. They discovered particularly strong associations between positively judging others and how enthusiastic, happy, kind-hearted, courteous, emotionally stable and capable the person describes oneself and is described by others. "Seeing others positively reveals our own positive traits," Wood says. The study also found that how positively you see other people shows how satisfied you are with your own life, and how much you are liked by others. I think this is true. When I'm in a funk I am really critical of others, and perhaps a good way to change is not so much to focus on being more positive about myself, but rather focus on the positive aspects of others. Speaking at length about the competing ideologies surrounding regulation, Summers distinguished between one side worrying that regulators will become "co-opted" by a conflict of interest, and the other afraid regulators are simply "ignorant" of the institutions they are charged with controlling. "There is hardly anyone," Summers said, "that is both knowledgeable and [sic] unco-opted." It's an insoluble problem in the public sector because anyone really knowledgeable is more valuable within one of the firms he regulates rather than outside it, creating a constant brain drain. There are exceptions to be sure, but the talent will always disproportionately on the inside. Financial entities make money in very complex ways, making an outsider's job very difficult even if able and motivated. When I have seen regulators, invariably they are focusing on some check list developed in Washington that is so irrelevant. The key to managing government this century has been to remove individual authority. The abuses of the spoils system of a century ago are far more vivid in the modern mind than the bureaucratic inertia that slowly drains our national vitality. Bureaucrats have discovered one best way to avoid blame: by creating systems in which no one has the ability to do anything not in a rulebook created years ago by bureaucrats who haven't been on the front line. Effective regulators, when they exist, are free to make the countless judgments needed to make something good happen, as when an analyst decides that a bank is a 'sell'. Yet this now only happens to firms so weak they are already almost dead, protecting us only after the damage has been done. For over a hundred years we have been erecting regulatory systems designed to add licensing and other criteria that supposedly make things safe. But no system of licensing, nor any regulatory system, no matter how brilliantly conceived, will function as intended unless humans have primacy over ultimate judgments ant every level of responsibility. When people focus on compliance instead of making sense of the situation, you get irrelevancy. Holding people and companies responsible for their actions is the most important way of enforcing genuine ethical and efficient behavior, and I don't see how government regulators can do this. Remember, the best regulator ever invented is competition, which involves breaking down barriers to entry, and expediting the failure process that is an essential part of competition (including defaults with loss of principal, foreclosures), is the exact opposite of what most regulations actually do. It's naive to think a checklist in Washington will be effective, as any explicit process invites its circumvention. After all, for years Washington wanted more housing loans, and when the hucksters started gaming the system with NINJA loans, it was Fannie Mae software that really institutionalized it, and then they acted shocked that such loans were commonplace. We find that CFOs earn statistically and economically higher abnormal returns following their purchases of company shares than CEOs. During 1992-2002, CFOs earned an average 12-month excess return that is 5% higher than that by CEOs. What Happened to Hedge Fund Replication? I remember when Harry Kat was getting a lot of play in 2006/7 for his idea you can replicate various hedge funds via futures. I was skeptical because while any fund with 5 years of monthly returns will generate a nice in-sample fit with something, such data are not really 60 independent observations because their will be a handful of big bets that were correlated with some sector. In my experience working at hedge funds you could point to a few key strategic moves that explained most of the returns, and as people changed, or the strategy died, it was hardly an internal factor loading, just a coincidence. I got a couple calls from industry magazines doing pieces on Kat, and both declined to incorporate any of my criticisms. Calendar effects in stock returns have been prominent in the finance literature since the 1970s. It's easy to pull in a time series and look at things like January, Monday, or beginning of month. Josef Lakonishok and Robert Haugen wrote a book, The Incredible January Effect, in 1988. Alas, most of this effect was in smaller stocks that were hard to trade, and while it may have existed, it no longer does. I used to think these calendar effects were gone, but the end-of-the-month effect seems to live on. Lakonishok and Smidt (1988) reported a turn-of-the month seasonal in equity returns wherein the turn-of-the-month is defined as beginning with the last trading day of the month and ending with the third trading day of the following month. Using the Dow Jones Industrial Average, they find that on average the four days at the turn-of-the-month account for all of the positive return to the DJIA over the period of 1897-1986. 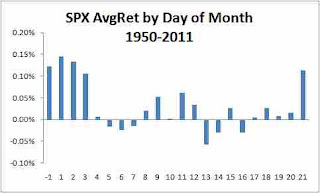 More specifically, over this 90-year period, the average cumulative return over the four-day turn-of-the-month is 0.47% whereas the average cumulative return over the full month is 0.35%, indicating that returns were, on average, negative over the remaining days of the month. So I downloaded the S&P data from 1950, and was surprised to see it actually works! Data are averages of log returns, and days are trading days from the beginning of the month, where -1 is the day immediately before the end of the month. See the top graph. But then I looked at the past 10 years, and the results seem not so good. Looks like another example of failed or extinct calendar effects. If you are in the investment industry, you should read this book. You should know the facts across different asset classes. These are essential facts. 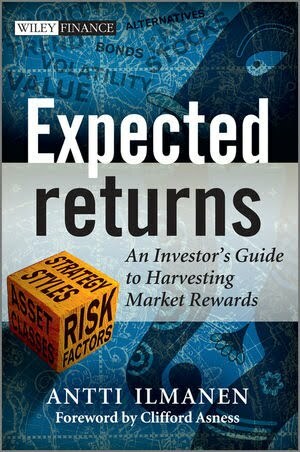 I just got Antti Ilmanen's Expected Returns, and think it's a great reference for any investment professional. Like my book, it's published by Wiley, which mean you can always buy it for half the list price on Amazon vs. going directly to Wiley (how this makes sense I have no idea). He describes the theory and data behind all the major investment strategies (eg, value, carry trade, selling volatility) and asset classes (eg, stocks, bonds, FX, real estate). At 594 pages, and given the failure of risk models and the parochial nature of various behavioral explanations, it is not a focused book, more like a compendium of what the 'state of the art' thinking is on the theory and data, as opposed to a strong theme. Indeed, there are many bullet points for the summary chapters and for the subsections, and each seem pretty independent. Yet, if you want to invest in the carry trade, or value stocks, it's a great place to go to understand the conventional wisdom on these investments. I've been a fan of Ilmanen since he wrote several clear and concise white papers on yield curve investing back in the 1990s (here's a zipped set). At one point he states 'My preferred approach to stuydying return consistency across subperiods is to plot cumulative returns over time. Careful eyeballing of such praphs reveals performance for any subperiod of interest, especially if he graphs are in log scale.' This kind of straightforward approach I find refreshing, because given the failure of any risk metric to generalize within or across asset classes, I find the abstruse models that claim some fundamental relation to a utility function, then proven econometrically but unamenable to a simple graph, highlights the rigor of modern finance is primarily a convenient way to hide for dopey ideas the way post-modernists hide their stupidity behind incomprehensibility. As Cliff Asness note in the forward to this book, 'the first moment laughs at and taunts the second moment', meaning basically that means are much less certain than variances and covariances, and ultimately we want to know what the 'average return' has been for various assets and strategies. This is not obvious, because you can have periods like 1960 to 1982, where bond returns were strictly decreasing in duration as rates rose, and then the opposite from 1982-2008 when rates went the other way. But Ilmanen highlights the cases such as these where combining historical data with forward looking metrics like yields to highlight what a good expectation in these cases might be. Now, I've corresponded a bit with Antti over the years, he's about my age, graduating about the same time. I respect him a lot. Thus, when I think about conventional wisdom in academic finance I think it's good to think about Antti, someone I think is thoughtful, smart, sincere, but also wrong about some very important points, most prominently, that this is consistent with some as-yet-undiscovered risk model. He's a little too charitable towards various esteemed citations, as he presents the various explanations for asset/strategy returns, often inconsistent. For example, in the chapter on the premium to selling puts, he references Taleb's Black Swan, which basically argues that gamma is underpriced because people prefer negative skew (ie, people lose money selling volatility because they love the positive modal return). He references DeBondt and Thaler's 'mean reversion' findings, though they have not stood up well: they were driven by untradeable stocks, which is why they were not replicated--the ultimate rejection. Ilmanen speaks well of Peter Bernstein, who wrote incredibly popular and interesting books that have been exposed as being totally wrong (ie, the Modern Portfolio Theory lionized in Capital Ideas or Against the Gods is now admitted to be empirically vacuous--I think that matters). I guess as Malcom Gladwell, Steve Levitt, or Michael Lewis have shown, a good yarn just needs the facts to be plausible at that time, whether or not they were subsequently shown totally wrong seems irrelevant. He also states that Robert Shiller called the housing bubble, which is true only if you count the statement that the previous rise from 2000-2005 would probably not extend, and some cities may experience declines, as the same thing as predicting a wholesale decline in housing prices. A paper is not true or profound merely because it is popular. Indeed, many papers are more popular the more flawed they are because they present an easy straw man to best (as a default modeler, one always references Altman (1967), because it is popular and a really inferior model). In some asset classes, like Hedge Funds, he notes that average top-line returns of 14% are turned to 7% when a couple of obvious adjustments are made for survivorship biases, and admits even then that since data are supplied voluntarily, this is incomplete. Yet such issues also occur in something as simple as equities, where he totally ignores transaction costs, taxes, adverse timing (market inflows). He notes investing in 'art' has had a pretty large positive real return, somewhere betveen 1 and 5%. As Felix Salmon has noted, these art indices exclude most art because if it is bought and never sold--usually because it cannot be sold--it simply disappears from the index, severely biasing such indices. Further, transaction costs selling art are considerable and not included in art indices. 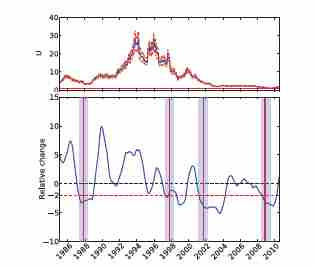 This highlights that estimating the first moment (mean returns) is quite subtle not merely because limited number of business cycles, but the data we have are often biased and so do not reflect a 'return to an average investor' (eg, buying a mutual fund in the 1960's had an 8.5% load right off the top). These are not small adjustments, and highlights the important adjustments are not sophisticated statistics, but rather yeoman's work. As to the 'expected returns' distinction, this I find really gets into scholasticism. Theoretically, there's only a relation between expected risk and expected returns, what actually happens involves random chance. As expected returns change over time, and one only observes average returns, one can argue that expected returns are quite different than what was experienced, or not. He notes that 'periods of high realized returns and rsing asset valuations--think stock markets in the 1990s--are often associated with falling forward-looking returns.' ORLY? If people in 2000 expected to experience the next decade of negative returns and also massive volatility, stockholders were making the stupidest financial decision since Esau traded his inheritance for a bowl of soup. Sharpe and Amromin (2009) surveyed investors and found they basically were inversely related to subsequent returns, reaching a peak at the top of the internet bubble at the end of the 1990s. So were expected returns higher then, as suggested by what investors said, or lower, as suggested by the returns the realized (and ex-post measures of valuations implied)? This conflation of average and expected returns is used selectively by academics all the time, where 'sample average' is synonymous with 'expected' sometimes, and sometimes not, depending on the author's objective. It makes one wonder if the 10^500 universes of string theory is more falsifiable than asset pricing theory. 1) Simple valuation metrics like P/Es in stocks, the current roll in futures, or yield spreads between currencies, help predict returns. They are easy to measure so try to have them on your side. It does not seem like any 'risk' premium, but rather a free lunch (or, the same thing, a risk premium so convoluted no one understands it and it does not generalize). 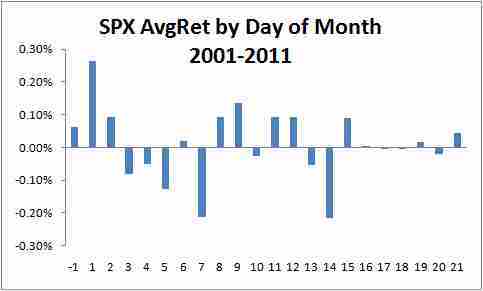 2) Momentum, chasing past returns, is not a bad strategy. That is, invest more in asset classes and strategies that have been working over the past year. Again, it seems like a risk-free, easy way, to improve returns. Bottom line is that if you are presenting a case for some major asset allocation, you should be familiar with the data and arguments noted in this book. FAA Administrator Randy Babbitt told a congressional hearing that the controller was "found intentionally sleeping" in the radar room during a midnight shift on February 19 in Knoxville, Tennessee. Babbitt said the agency is seeking to have the person, who was not named, fired. The sleeping controller was found asleep with cushions and a blanket. 'Was seeking?' Sleeping on the job is pretty common, but usually the results are straightforward and not worthy of comment. I suppose, like not paying your mortgage, that means in 438 days or so. Gotta love Spring Break. Get to visit the in-laws, whose internet connectivity consists of a AOL LAN connection! Mother-in-law says she doesn't use it much, but I imagine she might if it didn't take so long to load pages. I love seeing all the cows on the side of the highways here, part of a tax scam where you get a different assessment if your land is 'agricultural', about 1/100 the otherwise rate (it's called greenbelting, preserving the agriculture). Thus, a dozen random cows in property ready for redevelopment, rented for the minimum time needed for the zoning. Strangely, I note that everywhere I go there's the option for 'debit' when you ring a transaction that does not work on my debit/credit card so you have to push 'credit'. But then, why the choice? This little bug has been persistent in my Minnesota Home Depot for 10 years, and seems a nationwide issue. Anyway, vacation reminds me that the happiness available to any man is available to everyman, as really all one needs are G-forces and water, and those are pretty accessible anywhere. But...the princesses here are a surreal treat for my 3-yr old Isabel, whose conception of reality has now been pushed back a couple years. experience. David Henderson noted that capital cushions are not cushions at all, highlighting a perverse effect of these requirements. One of the more interesting puzzles in banking is the absence of any clear leverage-risk nexus in the statistical data. I know everyone thinks the past recession proved leverage is an obvious and soluble problem, but that's anecdotal, and I doubt that Bear, Fannie, or AIG would have survived with twice their capital. Hyman Minsky's financial instability hypothesis remained obscure until after his death precisely because there wasn't clear evidence between leverage and business cycles (as an acolyte, I would have loved proving the big man right...alas, he missed a lot). When I was head of capital allocations at a bank, every week I would be in a meeting or presentation where the logic of our mission was that higher 'risk' required a greater 'cushion' for bad times, a greater equity charge. I still think this is a good idea (no better alternative), but the whole 'cushion' idea simply doesn't generalize. We (consultants, regulators, advocates) looked cross-sectionally at banks, but could not see a clear cost-of-funning and leverage connection, and it would have helped me immensely to have such a finding. Also, one of the big goals in modeling default risk would be to create a financial firm model, because many banks and finance companies do not have agency ratings. Again, I worked at an institution that would have loved demonstrating this, but there is almost zero correlation between leverage and default rates. Given the financial sector has been in aggregate insolvent in 1975, 1981, 1990, and 2008, I would say it is generally undercapitalized by a factor of two. Yet, proposals to require a capital amount of, say, 8% of assets counterproductive. This is because a good portion of a firm's value is its franchise value, the present value of its brand, and all the myriad regulatory contrivances that keep competition at bay. Now, if a firm's capital amount is 8.01%, as a debtor I realize this firm is a coin flip away from losing that franchise value, and then I might have a principal loss on my debt. The "capital cushion" becomes simply a new trigger value, as opposed to resource to tap in tough times. The bottom line is, as long as the private sector anticipates little or no risk, it will skate close to the edge, which will be the regulatory minimum, not zero (either spell death, and thus a liquidation of sorts). Perhaps, given the politics of closing failing banks, there should be a bank asset size limit because we can anticipate a Goldman simply having too many connections to ever let it fail, whereas ten firms each with one tenth the size wouldn't have such pull. I can be convinced of that. As per the private sector underestimating risk, I agree this happens, but only after a couple generations. The safety of the 1950s was not due to regulation, it was because these bankers had experienced failure first hand and such lessons leave a mark (did any actually read the SEC act of 1933 and 34? It simply has brokers sign statements saying they won't rob you blind, an oath administered by Joe P. Kennedy). Just look at how Commercial Real Estate has done subsequent to its 1990 crisis (lower-than-average defaults), or how tech firms did after their 2001 debacle, to see that while the public is fooled again and again it's not the same generation on the same products. So, bankers and everyone else believed there was too little risk in mortgage lending. Currently mortgage debt needs 50% down payments to get securitized in the private market, so they don't need top-down reminders that this is risky. Indeed, the government is lending at 3.5% down (FHA), so I would say they aren't exactly leading by example. For about 10 seconds I thought they were serious, which makes it all the funnier...see Google's new 'Motion' app. Also, jobs for autocompleters...background in spellchecking a plus!